Were you good at math when you were growing up? I was. It was my most favorite subject in school, and while most of my friends struggled with multiplication tables and long division, I loved it. This worked out well for my mother as math was not her forte and teaching times tables wasn’t exactly on her list of priorities when we were growing up, and while I always assumed I would pass my love for math onto my own daughter, age (and sleep deprivation) has a way of changing us. I can barely add 2 single-digit numbers together without a calculator these days (thank goodness for smart phones! ), and the idea of teaching multiplication to my sweet girl makes me break into a cold sweat. But teaching times tables to kids is a right of passage for parents, and I’m pretty sure I’m not going to get out of this one alive, so I figure I may as well be prepared. And since I know there are HEAPS of other parents out there (literally) pulling their hair out as they attempt to help their child memorize their multiplication tables, I’m sharing my favorite games and activities to teach kids multiplication without losing your sanity. As painful as it is to teach kids multiplication, it’s important that we get involved and help them practice at home. Why? Because times tables are an essential building block in math, and help children with other math strategies and concepts, like fractions, decimals, percentages, area, perimeter, measures, and even telling time. If we don’t make teaching multiplication a priority when our children are young, it will make it harder for them to learn other math concepts as they grow. At what age should you know your times tables? When I think back to my own childhood, I can remember memorizing my times tables in grades 3 and 4, but just to be sure, I did a quick search on Google and it seems the recommended age at which a child should know her multiplication table ranges between 9 and 11, which seems about right to me. Of course, your child’s math curriculum will be dictated by the school/district she’s in (unless you homeschool, of course), but this seems to be the age range teachers aim for when it comes to teaching multiplication. What’s the best order for teaching times tables? You can read more about the reasoning behind this approach to see if it makes sense for you and your child HERE. And now for the fun part! There are lots of fun multiplication games for kids, and we’ve rounded up 8 of our favorites below which can help make teaching times tables at home a lot less…painful. LOL. Did you ever play the ‘Squares’ game when you were a kid? You know, the one where you drew 100 dots on a piece of paper and took turns drawing a line to connect 2 dots to draw a square, with the goal of being the person to draw the most squares once all of the dots were connected? 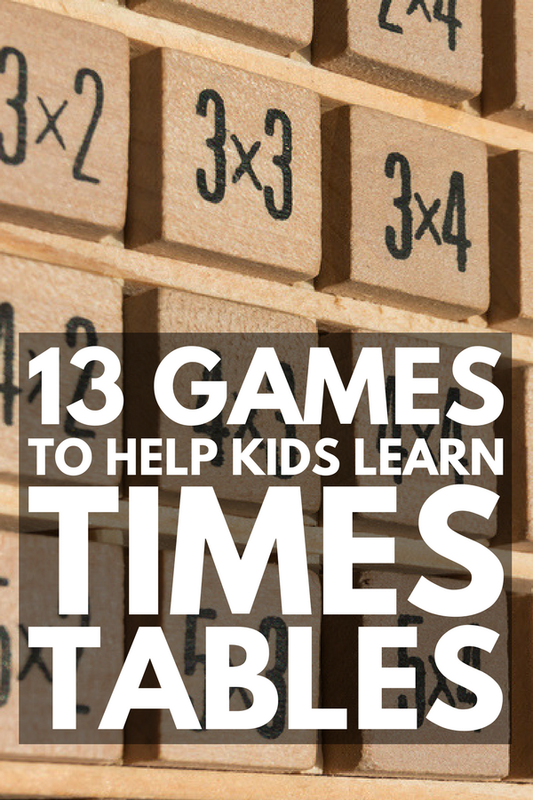 Well, Games 4 Gains has create a BRILLIANT multiplication table game based on this concept. All you need is a set of dice and a couple of pens to play. Download the game for free HERE. This is one of my favorite times tables games as it’s fun and gets kids excited to win! This is a great game for kids to play together in the classroom, or for the whole family to enjoy. All you need is a deck of cards! Got a set of dominos lying around? This is a fun way to get kids excited about their times tables, and you can use it to teach addition and subtraction to younger kids, too! This free download makes for a great multiplication game for small groups in a classroom or during an afternoon playdate. All you need is a set of dice and you’ve got the perfect quiet activity to keep your little ones learning. Teaching multiplication just got easier with these free find-a-fact practice sheets. These are designed to be completed with a partner in a school setting, but can double as an after school study date game, and can work for independent learning as well. This is a great multiplication game kids can play independently. All you need is a a set of dice and a bingo dauber, and with 11 different games you can download for free, you’re little ones will enjoy hours of fun! This card game is geared towards kids in 3rd to 5th grade, and it’s loads of fun. All you need is a deck of cards, a set of dice, and a set of game pawns and you have the perfect family game night idea to keep your kids learning outside of the classroom! This is more of a game concept than an actual game, and it can be adapted to teach so many different math skills. For teaching times tables, all you need are a set of popsicle sticks, a Sharpie marker, and a small container to keep everything contained (Jillian suggests using a Crystal Light container, and I have to agree it works perfectly!). CLICK HERE to learn more! While games offer a great way to interact with and teach our kids important skills, there are also a lot of great activities children can work on at home to help them memorize their times tables, many of which also encourage independent learning – an important skill for our kids, and a great way for moms and dads to get things done around the house! Did you know there’s an entire site dedicated to free worksheets for kids in Pre-K to grade 5? Neither did I! These Multiplication Target Circle practice sheets are a great independent after school activity to help teach times tables and they are free to download! If your kids love to build with LEGO, this is another fun way to help your kids learn about multiplication independently! Arrays offer a fantastic visual representation of multiplication to kids, and this is a great activity for beginners. All you need is some construction paper and a single hole punch as well as a few printed worksheets with multiplication questions. This is by far one of my favorite independent multiplication activities for kids. It’s the perfect after school activity to help kids unwind and reach a state of calm after a busy day, but still supports their learning! These mats offer a great approach to teaching times tables as they show children that there are multiple ways to solve a multiplication problem, which in turn helps them to better understand how multiplication works. While a bit pricey, this workbook has EVERYTHING you need to teach your kids about multiplication, and it’s a great learning resource to use at home to compliment the lessons taught at school. If you have any spare paper plates lying around, this multiplication practice wheel is a great after school activity to help teach kids multiplication. In a day and age of notebook computers and smart phones, we sometimes question the importance of teaching times tables to our kids. Is it really that important? Unfortunately, the answer is yes. As daunting as it may seem, teaching kids multiplication is an essential building block in learning other important mathematical skills, like percentages and telling time, and the more we support our children at home, the more successful they will be. I hope these multiplication games and activities for kids prove helpful to you! If you found this post about teaching times tables helpful, please share this post on Pinterest! And if you’re looking for more learning games and activities for kids, please follow our Kids board where we share all kinds of great ideas we find each day!